In the north of Italy lies the ever-winding road known as Passo dello Stelvio. Of the paved mountain passes that are scattered across the mountainous Alps, it is one of the highest in terms of elevation and has been called (one of, if not) the ‘Greatest Driving Road’ in the world. Considering its heritage it should be no surprise that, of all automakers, Alfa Romeo would be the one to conceive a namesake in the form of a sport-inspired luxury crossover. And the choice of inspiration is evident in the result, making the Stelvio an entirely unique entity within the segment. Offering the kind of accuracy of steering required to navigate such a winding road, it offers the kind of speed and handling that would make it fun to try. More diminutive in size, it favors sport while competitors remain focused on versatility. Tastefully styled, it stands as an usher of change, refreshing our idea of how a crossover looks as well as how it performs. To those interested in exploring the 2018 Alfa Romeo Stelvio – Albany, NY beckons. Visiting Alfa Romeo of Albany provides an ideal opportunity to get to know the Stelvio (as well as its breathtaking stablemates). Priced to start around $41,995 MSRP the Stelvio is a new offering to the 2018 model year. A compact, all-wheel-drive luxury crossover, it stands against the likes of the Audi Q5, Jaguar F-PACE, and Porsche Macan. With iconic Italian ‘fiuto’, the Stelvio follows the traditional Alfa Romeo model of offering three trim levels: a more accessible base model followed by the more luxurious Ti, accented finally by the elite Quadrifoglio trim. While the Quadrifoglio has yet to be released, it stands to reason that it will exist as an entirely separate entity; a unique realization of the Stelvio design. However, standing similarities between the Stelvio and the Giulia provide a reliable indication of how the Quadrifoglio may perform. The Stelvio’s Italian pedigree is affirmed in its formidable equipment. The base and Ti trim levels are powered by a turbocharged four-cylinder engine paired with an eight-speed automatic. Thrusting 280 horsepower and 306 lb-ft of torque, it has a top speed of 144 mph and is rated for 25 mpg combined. The Quadrifoglio is expected to boast the same twin-turbocharged 2.9-liter V6 engine used in the Giulia. Mated with an eight-speed automatic transmission, the all-aluminum Ferrari-based engine would be rated for 505 horsepower and 443 lb-ft of torque. ‘Impenitente’ is the Italian word for ‘unapologetic’, and that is exactly what the Stelvio is. Making no discernible effort to emulate or duplicate the design of other crossover SUV’s, it is both distinctive and inspired in its self-awareness. Traditional crossovers are celebrated for offering SUV versatility in a more modestly-proportioned package. It could be argued that this is achieved with a kitchen-sink mentality, piling utility upon utility with an endless focus on function over form. The inevitable result of such decisions is the bland and boxy design of most truck or wagon-inspired crossover SUVs. Alfa could never be accused of such a design crime, preferring to focus on refinement. 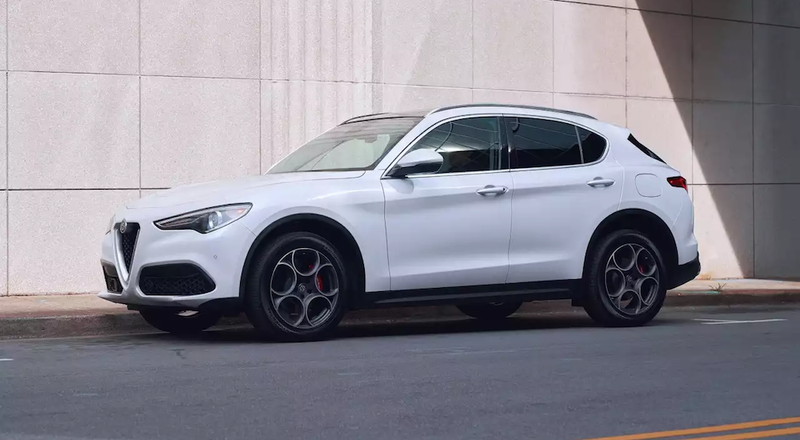 This decision extends through the Stelvio’s more modest exterior dimensions. Complimented further by its streamlined shape and contoured sculpting, the Stelvio appears muscular and athletic. From its Scudetto triangular shield to its fastback-tapered tail, every detail communicates it sport-inspired performance. Depending on the trim level selected, the Stelvio rides confidently on 18, 19 or 20-inch wheels. But regardless of which is selected, it makes an immediate impact as it enters, casts a captivating profile as it passes, and leaves a lasting impression behind it. Step inside the Stelvio and you’ll find that minimalism prevails. Speaking of refinement, its design recognizes that ‘just because you can, doesn’t mean you have to’. There is no shortage of amenities present, but they are tastefully (and sparingly) factored into the cabin layout. Another example of valuing form over function, the Stelvio is sublime in its simplicity. But simply isn’t synonymous with boring. One of Alfa’s strongest design choices comes in the two-tone coloring options available for its luxury leather interiors. The black/red combination, for example, acts as a spotlight, highlighting the strength of Alfa’s design choices within its iconic interiors. Suddenly, the Stelvio’s minimalist design becomes emboldened, accenting leather-wrapped surfaces, carbon trim and the overall spaciousness of the fore-cabin. This is only furthered by the ambient lighting that sets a welcoming tone for passengers. Alfa’s sporting nature prevails in creating a stylish and enticing interior, that is far more ‘performance sedan’ than traditional ‘crossover’. In an era of overwhelming interfaces and amenity lists that serve to please everyone, the Stelvio excels in its back to basics approach. Once again, form over function comes into play with an infotainment system built around a 6.5-inch touchscreen (on the base, or 8.8-inch on the Ti) with rearview camera. The audio system consists of an eight-speaker sound system compatible with both Android Audio and Apple CarPlay. With USB ports (including two ‘charge only’) there is no shortage of ways to provide the Stelvio experience with an equally breath-taking soundtrack. We can only assume that the Quadrifoglio will offer an audio upgrade, such as the 14-speaker Harman Kardon system included in the top-level Giulia. Every bold design note. Every subtle nuance. The Stelvio is a concerto worthy of inclusion in the Alfa Romeo stable and speaks to a somewhat elite palate. In a world where the marketplace is inundated with accessibly-priced crossovers and SUVs locked in eternal competition, higher-tiered luxury offerings should stand clearly apart. None may be more successful than the Stelvio, which achieves its clear goal of being ‘something else entirely’.